Condensed matter physics is the field of physics that deals with the macroscopic and microscopic physical properties of matter. In particular it is concerned with the "condensed" phases that appear whenever the number of constituents in a system is extremely large and the interactions between the constituents are strong. The most familiar examples of condensed phases are solids and liquids, which arise from the electromagnetic forces between atoms. Condensed matter physicists seek to understand the behavior of these phases by using physical laws. In particular, they include the laws of quantum mechanics, electromagnetism and statistical mechanics. The most familiar condensed phases are solids and liquids while more exotic condensed phases include the superconducting phase exhibited by certain materials at low temperature, the ferromagnetic and antiferromagnetic phases of spins on crystal lattices of atoms, and the Bose–Einstein condensate found in ultracold atomic systems. The study of condensed matter physics involves measuring various material properties via experimental probes along with using methods of theoretical physics to develop mathematical models that help in understanding physical behavior. The diversity of systems and phenomena available for study makes condensed matter physics the most active field of contemporary physics: one third of all American physicists self-identify as condensed matter physicists, and the Division of Condensed Matter Physics is the largest division at the American Physical Society. The field overlaps with chemistry, materials science, and nanotechnology, and relates closely to atomic physics and biophysics. The theoretical physics of condensed matter shares important concepts and methods with that of particle physics and nuclear physics. A variety of topics in physics such as crystallography, metallurgy, elasticity, magnetism, etc., were treated as distinct areas until the 1940s, when they were grouped together as solid state physics. Around the 1960s, the study of physical properties of liquids was added to this list, forming the basis for the new, related specialty of condensed matter physics. According to physicist Philip Warren Anderson, the term was coined by him and Volker Heine, when they changed the name of their group at the Cavendish Laboratories, Cambridge from Solid state theory to Theory of Condensed Matter in 1967, as they felt it did not exclude their interests in the study of liquids, nuclear matter, and so on. Although Anderson and Heine helped popularize the name "condensed matter", it had been present in Europe for some years, most prominently in the form of a journal published in English, French, and German by Springer-Verlag titled Physics of Condensed Matter, which was launched in 1963. The funding environment and Cold War politics of the 1960s and 1970s were also factors that lead some physicists to prefer the name "condensed matter physics", which emphasized the commonality of scientific problems encountered by physicists working on solids, liquids, plasmas, and other complex matter, over "solid state physics", which was often associated with the industrial applications of metals and semiconductors. The Bell Telephone Laboratories was one of the first institutes to conduct a research program in condensed matter physics. References to "condensed" state can be traced to earlier sources. For example, in the introduction to his 1947 book Kinetic Theory of Liquids, Yakov Frenkel proposed that "The kinetic theory of liquids must accordingly be developed as a generalization and extension of the kinetic theory of solid bodies. As a matter of fact, it would be more correct to unify them under the title of 'condensed bodies'". In 1823, Michael Faraday, then an assistant in Davy's lab, successfully liquefied chlorine and went on to liquefy all known gaseous elements, except for nitrogen, hydrogen, and oxygen. Shortly after, in 1869, Irish chemist Thomas Andrews studied the phase transition from a liquid to a gas and coined the term critical point to describe the condition where a gas and a liquid were indistinguishable as phases, and Dutch physicist Johannes van der Waals supplied the theoretical framework which allowed the prediction of critical behavior based on measurements at much higher temperatures. :35–38 By 1908, James Dewar and Heike Kamerlingh Onnes were successfully able to liquefy hydrogen and then newly discovered helium, respectively. In 1911, three years after helium was first liquefied, Onnes working at University of Leiden discovered superconductivity in mercury, when he observed the electrical resistivity of mercury to vanish at temperatures below a certain value. The phenomenon completely surprised the best theoretical physicists of the time, and it remained unexplained for several decades. Albert Einstein, in 1922, said regarding contemporary theories of superconductivity that "with our far-reaching ignorance of the quantum mechanics of composite systems we are very far from being able to compose a theory out of these vague ideas." Drude's classical model was augmented by Wolfgang Pauli, Arnold Sommerfeld, Felix Bloch and other physicists. Pauli realized that the free electrons in metal must obey the Fermi–Dirac statistics. Using this idea, he developed the theory of paramagnetism in 1926. Shortly after, Sommerfeld incorporated the Fermi–Dirac statistics into the free electron model and made it better able to explain the heat capacity. Two years later, Bloch used quantum mechanics to describe the motion of a quantum electron in a periodic lattice. :366–368 The mathematics of crystal structures developed by Auguste Bravais, Yevgraf Fyodorov and others was used to classify crystals by their symmetry group, and tables of crystal structures were the basis for the series International Tables of Crystallography, first published in 1935. Band structure calculations was first used in 1930 to predict the properties of new materials, and in 1947 John Bardeen, Walter Brattain and William Shockley developed the first semiconductor-based transistor, heralding a revolution in electronics. The Sommerfeld model and spin models for ferromagnetism illustrated the successful application of quantum mechanics to condensed matter problems in the 1930s. However, there still were several unsolved problems, most notably the description of superconductivity and the Kondo effect. After World War II, several ideas from quantum field theory were applied to condensed matter problems. These included recognition of collective excitation modes of solids and the important notion of a quasiparticle. Russian physicist Lev Landau used the idea for the Fermi liquid theory wherein low energy properties of interacting fermion systems were given in terms of what are now termed Landau-quasiparticles. Landau also developed a mean field theory for continuous phase transitions, which described ordered phases as spontaneous breakdown of symmetry. The theory also introduced the notion of an order parameter to distinguish between ordered phases. 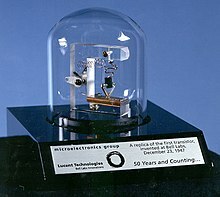 Eventually in 1965, John Bardeen, Leon Cooper and John Schrieffer developed the so-called BCS theory of superconductivity, based on the discovery that arbitrarily small attraction between two electrons of opposite spin mediated by phonons in the lattice can give rise to a bound state called a Cooper pair. The study of phase transition and the critical behavior of observables, termed critical phenomena, was a major field of interest in the 1960s. Leo Kadanoff, Benjamin Widom and Michael Fisher developed the ideas of critical exponents and widom scaling. These ideas were unified by Kenneth G. Wilson in 1972, under the formalism of the renormalization group in the context of quantum field theory.
.(see figure) The effect was observed to be independent of parameters such as system size and impurities. In 1981, theorist Robert Laughlin proposed a theory explaining the unanticipated precision of the integral plateau. It also implied that the Hall conductance can be characterized in terms of a topological invariable called Chern number. :69, 74 Shortly after, in 1982, Horst Störmer and Daniel Tsui observed the fractional quantum Hall effect where the conductance was now a rational multiple of a constant. Laughlin, in 1983, realized that this was a consequence of quasiparticle interaction in the Hall states and formulated a variational method solution, named the Laughlin wavefunction. The study of topological properties of the fractional Hall effect remains an active field of research. In 1986, Karl Müller and Johannes Bednorz discovered the first high temperature superconductor, a material which was superconducting at temperatures as high as 50 kelvins. It was realized that the high temperature superconductors are examples of strongly correlated materials where the electron–electron interactions play an important role. A satisfactory theoretical description of high-temperature superconductors is still not known and the field of strongly correlated materials continues to be an active research topic. In 2009, David Field and researchers at Aarhus University discovered spontaneous electric fields when creating prosaic films[clarification needed] of various gases. This has more recently expanded to form the research area of spontelectrics. In 2012 several groups released preprints which suggest that samarium hexaboride has the properties of a topological insulator  in accord with the earlier theoretical predictions. Since samarium hexaboride is an established Kondo insulator, i.e. a strongly correlated electron material, the existence of a topological surface state in this material would lead to a topological insulator with strong electronic correlations. Theoretical condensed matter physics involves the use of theoretical models to understand properties of states of matter. These include models to study the electronic properties of solids, such as the Drude model, the Band structure and the density functional theory. Theoretical models have also been developed to study the physics of phase transitions, such as the Ginzburg–Landau theory, critical exponents and the use of mathematical methods of quantum field theory and the renormalization group. Modern theoretical studies involve the use of numerical computation of electronic structure and mathematical tools to understand phenomena such as high-temperature superconductivity, topological phases, and gauge symmetries. Theoretical understanding of condensed matter physics is closely related to the notion of emergence, wherein complex assemblies of particles behave in ways dramatically different from their individual constituents. For example, a range of phenomena related to high temperature superconductivity are understood poorly, although the microscopic physics of individual electrons and lattices is well known. Similarly, models of condensed matter systems have been studied where collective excitations behave like photons and electrons, thereby describing electromagnetism as an emergent phenomenon. Emergent properties can also occur at the interface between materials: one example is the lanthanum aluminate-strontium titanate interface, where two non-magnetic insulators are joined to create conductivity, superconductivity, and ferromagnetism. The metallic state has historically been an important building block for studying properties of solids. The first theoretical description of metals was given by Paul Drude in 1900 with the Drude model, which explained electrical and thermal properties by describing a metal as an ideal gas of then-newly discovered electrons. He was able to derive the empirical Wiedemann-Franz law and get results in close agreement with the experiments. :90–91 This classical model was then improved by Arnold Sommerfeld who incorporated the Fermi–Dirac statistics of electrons and was able to explain the anomalous behavior of the specific heat of metals in the Wiedemann–Franz law. :101–103 In 1912, The structure of crystalline solids was studied by Max von Laue and Paul Knipping, when they observed the X-ray diffraction pattern of crystals, and concluded that crystals get their structure from periodic lattices of atoms. :48 In 1928, Swiss physicist Felix Bloch provided a wave function solution to the Schrödinger equation with a periodic potential, called the Bloch wave. Calculating electronic properties of metals by solving the many-body wavefunction is often computationally hard, and hence, approximation methods are needed to obtain meaningful predictions. The Thomas–Fermi theory, developed in the 1920s, was used to estimate system energy and electronic density by treating the local electron density as a variational parameter. Later in the 1930s, Douglas Hartree, Vladimir Fock and John Slater developed the so-called Hartree–Fock wavefunction as an improvement over the Thomas–Fermi model. The Hartree–Fock method accounted for exchange statistics of single particle electron wavefunctions. In general, it's very difficult to solve the Hartree–Fock equation. Only the free electron gas case can be solved exactly. :330–337 Finally in 1964–65, Walter Kohn, Pierre Hohenberg and Lu Jeu Sham proposed the density functional theory which gave realistic descriptions for bulk and surface properties of metals. The density functional theory (DFT) has been widely used since the 1970s for band structure calculations of variety of solids. Some states of matter exhibit symmetry breaking, where the relevant laws of physics possess some form of symmetry that is broken. A common example is crystalline solids, which break continuous translational symmetry. Other examples include magnetized ferromagnets, which break rotational symmetry, and more exotic states such as the ground state of a BCS superconductor, that breaks U(1) phase rotational symmetry. Goldstone's theorem in quantum field theory states that in a system with broken continuous symmetry, there may exist excitations with arbitrarily low energy, called the Goldstone bosons. For example, in crystalline solids, these correspond to phonons, which are quantized versions of lattice vibrations. Phase transition refers to the change of phase of a system, which is brought about by change in an external parameter such as temperature. Classical phase transition occurs at finite temperature when the order of the system was destroyed. For example, when ice melts and becomes water, the ordered crystal structure is destroyed. In quantum phase transitions, the temperature is set to absolute zero, and the non-thermal control parameter, such as pressure or magnetic field, causes the phase transitions when order is destroyed by quantum fluctuations originating from the Heisenberg uncertainty principle. Here, the different quantum phases of the system refer to distinct ground states of the Hamiltonian matrix. Understanding the behavior of quantum phase transition is important in the difficult tasks of explaining the properties of rare-earth magnetic insulators, high-temperature superconductors, and other substances. Experimental condensed matter physics involves the use of experimental probes to try to discover new properties of materials. Such probes include effects of electric and magnetic fields, measuring response functions, transport properties and thermometry. Commonly used experimental methods include spectroscopy, with probes such as X-rays, infrared light and inelastic neutron scattering; study of thermal response, such as specific heat and measuring transport via thermal and heat conduction. Image of X-ray diffraction pattern from a protein crystal. The first Bose–Einstein condensate observed in a gas of ultracold rubidium atoms. The blue and white areas represent higher density. Ultracold atom trapping in optical lattices is an experimental tool commonly used in condensed matter physics, and in atomic, molecular, and optical physics. The method involves using optical lasers to form an interference pattern, which acts as a lattice, in which ions or atoms can be placed at very low temperatures. Cold atoms in optical lattices are used as quantum simulators, that is, they act as controllable systems that can model behavior of more complicated systems, such as frustrated magnets. In particular, they are used to engineer one-, two- and three-dimensional lattices for a Hubbard model with pre-specified parameters, and to study phase transitions for antiferromagnetic and spin liquid ordering. In 1995, a gas of rubidium atoms cooled down to a temperature of 170 nK was used to experimentally realize the Bose–Einstein condensate, a novel state of matter originally predicted by S. N. Bose and Albert Einstein, wherein a large number of atoms occupy one quantum state. Research in condensed matter physics has given rise to several device applications, such as the development of the semiconductor transistor, laser technology, and several phenomena studied in the context of nanotechnology. :111ff Methods such as scanning-tunneling microscopy can be used to control processes at the nanometer scale, and have given rise to the study of nanofabrication. In quantum computation, information is represented by quantum bits, or qubits. The qubits may decohere quickly before useful computation is completed. This serious problem must be solved before quantum computing may be realized. To solve this problem, several promising approaches are proposed in condensed matter physics, including Josephson junction qubits, spintronic qubits using the spin orientation of magnetic materials, or the topological non-Abelian anyons from fractional quantum Hall effect states. Condensed matter physics also has important uses for biophysics, for example, the experimental method of magnetic resonance imaging, which is widely used in medical diagnosis. ^ Both hydrogen and nitrogen have since been liquified; however, ordinary liquid nitrogen and hydrogen do not possess metallic properties. Physicists Eugene Wigner and Hillard Bell Huntington predicted in 1935 that a state metallic hydrogen exists at sufficiently high pressures (over 25 GPa), but this has not yet been observed. ^ "Condensed Matter Physics Jobs: Careers in Condensed Matter Physics". Physics Today Jobs. Archived from the original on 2009-03-27. Retrieved 2010-11-01. ^ "History of Condensed Matter Physics". American Physical Society. Retrieved 27 March 2012. ^ a b c d Cohen, Marvin L. (2008). "Essay: Fifty Years of Condensed Matter Physics". Physical Review Letters. 101 (25): 250001. Bibcode:2008PhRvL.101y0001C. doi:10.1103/PhysRevLett.101.250001. PMID 19113681. Retrieved 31 March 2012. ^ a b Kohn, W. (1999). "An essay on condensed matter physics in the twentieth century" (PDF). Reviews of Modern Physics. 71 (2): S59–S77. Bibcode:1999RvMPS..71...59K. doi:10.1103/RevModPhys.71.S59. Archived from the original (PDF) on 25 August 2013. Retrieved 27 March 2012. ^ "Philip Anderson". Department of Physics. Princeton University. Retrieved 27 March 2012. ^ Anderson, Philip W. (November 2011). "In Focus: More and Different". World Scientific Newsletter. 33: 2. ^ "Physics of Condensed Matter". 1963. Retrieved 20 April 2015. ^ Martin, Joseph D. (2015). "What's in a Name Change? Solid State Physics, Condensed Matter Physics, and Materials Science". Physics in Perspective. 17 (1): 3–32. Bibcode:2015PhP....17....3M. doi:10.1007/s00016-014-0151-7. ^ a b c Goodstein, David; Goodstein, Judith (2000). "Richard Feynman and the History of Superconductivity" (PDF). Physics in Perspective. 2 (1): 30. Bibcode:2000PhP.....2...30G. doi:10.1007/s000160050035. Retrieved 7 April 2012. ^ Silvera, Isaac F.; Cole, John W. (2010). "Metallic Hydrogen: The Most Powerful Rocket Fuel Yet to Exist". Journal of Physics. 215 (1): 012194. Bibcode:2010JPhCS.215a2194S. doi:10.1088/1742-6596/215/1/012194. ^ Rowlinson, J. S. (1969). "Thomas Andrews and the Critical Point". Nature. 224 (8): 541–543. Bibcode:1969Natur.224..541R. doi:10.1038/224541a0. ^ Kittel, Charles (1996). Introduction to Solid State Physics. John Wiley & Sons. ISBN 978-0-471-11181-8. ^ a b c d Hoddeson, Lillian (1992). Out of the Crystal Maze: Chapters from The History of Solid State Physics. Oxford University Press. ISBN 978-0-19-505329-6. ^ a b Kragh, Helge (2002). Quantum Generations: A History of Physics in the Twentieth Century (Reprint ed.). Princeton University Press. ISBN 978-0-691-09552-3. ^ van Delft, Dirk; Kes, Peter (September 2010). "The discovery of superconductivity" (PDF). Physics Today. 63 (9): 38–43. Bibcode:2010PhT....63i..38V. doi:10.1063/1.3490499. Retrieved 7 April 2012. ^ Slichter, Charles. "Introduction to the History of Superconductivity". Moments of Discovery. American Institute of Physics. Retrieved 13 June 2012. ^ Schmalian, Joerg (2010). "Failed theories of superconductivity". Modern Physics Letters B. 24 (27): 2679–2691. arXiv:1008.0447. Bibcode:2010MPLB...24.2679S. doi:10.1142/S0217984910025280. ^ Aroyo, Mois, I.; Müller, Ulrich; Wondratschek, Hans (2006). Historical introduction (PDF). International Tables for Crystallography. A. pp. 2–5. CiteSeerX 10.1.1.471.4170. doi:10.1107/97809553602060000537. ISBN 978-1-4020-2355-2. ^ Hall, Edwin (1879). "On a New Action of the Magnet on Electric Currents". American Journal of Mathematics. 2 (3): 287–92. doi:10.2307/2369245. JSTOR 2369245. Archived from the original on 2007-02-08. Retrieved 2008-02-28. ^ Landau, L. D.; Lifshitz, E. M. (1977). Quantum Mechanics: Nonrelativistic Theory. Pergamon Press. ISBN 978-0-7506-3539-4. ^ Lindley, David (2015-05-15). "Focus: Landmarks—Accidental Discovery Leads to Calibration Standard". APS Physics. Archived from the original on 2015-09-07. Retrieved 2016-01-09. ^ a b c d Mattis, Daniel (2006). The Theory of Magnetism Made Simple. World Scientific. ISBN 978-981-238-671-7. ^ Chatterjee, Sabyasachi (August 2004). "Heisenberg and Ferromagnetism". Resonance. 9 (8): 57–66. doi:10.1007/BF02837578. Retrieved 13 June 2012. ^ Visintin, Augusto (1994). Differential Models of Hysteresis. Springer. ISBN 978-3-540-54793-8. ^ Merali, Zeeya (2011). "Collaborative physics: string theory finds a bench mate". Nature. 478 (7369): 302–304. Bibcode:2011Natur.478..302M. doi:10.1038/478302a. PMID 22012369. ^ a b Coleman, Piers (2003). "Many-Body Physics: Unfinished Revolution". Annales Henri Poincaré. 4 (2): 559–580. arXiv:cond-mat/0307004. Bibcode:2003AnHP....4..559C. CiteSeerX 10.1.1.242.6214. doi:10.1007/s00023-003-0943-9. ^ a b Coleman, Piers (2016). Introduction to Many Body Physics. Cambridge University Press. ISBN 978-0-521-86488-6. ^ a b von Klitzing, Klaus (9 Dec 1985). "The Quantized Hall Effect" (PDF). Nobelprize.org. ^ a b Fisher, Michael E. (1998). "Renormalization group theory: Its basis and formulation in statistical physics". Reviews of Modern Physics. 70 (2): 653–681. Bibcode:1998RvMP...70..653F. CiteSeerX 10.1.1.129.3194. doi:10.1103/RevModPhys.70.653. ^ Avron, Joseph E.; Osadchy, Daniel; Seiler, Ruedi (2003). "A Topological Look at the Quantum Hall Effect". Physics Today. 56 (8): 38–42. Bibcode:2003PhT....56h..38A. doi:10.1063/1.1611351. ^ David J Thouless (12 March 1998). Topological Quantum Numbers in Nonrelativistic Physics. World Scientific. ISBN 978-981-4498-03-6. ^ Wen, Xiao-Gang (1992). "Theory of the edge states in fractional quantum Hall effects" (PDF). International Journal of Modern Physics C. 6 (10): 1711–1762. Bibcode:1992IJMPB...6.1711W. CiteSeerX 10.1.1.455.2763. doi:10.1142/S0217979292000840. Retrieved 14 June 2012. ^ Quintanilla, Jorge; Hooley, Chris (June 2009). "The strong-correlations puzzle" (PDF). Physics World. Archived from the original (PDF) on 6 September 2012. Retrieved 14 June 2012. ^ Eugenie Samuel Reich. "Hopes surface for exotic insulator". Nature. ^ Dzero, V.; K. Sun; V. Galitski; P. Coleman (2010). "Topological Kondo Insulators". Physical Review Letters. 104 (10): 106408. arXiv:0912.3750. Bibcode:2010PhRvL.104j6408D. doi:10.1103/PhysRevLett.104.106408. PMID 20366446. ^ "Understanding Emergence". National Science Foundation. Retrieved 30 March 2012. ^ Levin, Michael; Wen, Xiao-Gang (2005). "Colloquium: Photons and electrons as emergent phenomena". Reviews of Modern Physics. 77 (3): 871–879. arXiv:cond-mat/0407140. Bibcode:2005RvMP...77..871L. doi:10.1103/RevModPhys.77.871. ^ a b Neil W. Ashcroft; N. David Mermin (1976). Solid state physics. Saunders College. ISBN 978-0-03-049346-1. ^ Eckert, Michael (2011). "Disputed discovery: the beginnings of X-ray diffraction in crystals in 1912 and its repercussions". Acta Crystallographica A. 68 (1): 30–39. Bibcode:2012AcCrA..68...30E. doi:10.1107/S0108767311039985. PMID 22186281. ^ Han, Jung Hoon (2010). Solid State Physics (PDF). Sung Kyun Kwan University. Archived from the original (PDF) on 2013-05-20. ^ a b Perdew, John P.; Ruzsinszky, Adrienn (2010). "Fourteen Easy Lessons in Density Functional Theory" (PDF). International Journal of Quantum Chemistry. 110 (15): 2801–2807. doi:10.1002/qua.22829. Retrieved 13 May 2012. ^ Nambu, Yoichiro (8 December 2008). "Spontaneous Symmetry Breaking in Particle Physics: a Case of Cross Fertilization". Nobelprize.org. ^ Greiter, Martin (16 March 2005). "Is electromagnetic gauge invariance spontaneously violated in superconductors?". Annals of Physics. 319 (2005): 217–249. arXiv:cond-mat/0503400. Bibcode:2005AnPhy.319..217G. doi:10.1016/j.aop.2005.03.008. ^ Leutwyler, H. (1997). "Phonons as Goldstone bosons". Helv.phys.acta ). 70 (1997): 275–286. arXiv:hep-ph/9609466. Bibcode:1996hep.ph....9466L. ^ a b Vojta, Matthias (2003). "Quantum phase transitions". Reports on Progress in Physics. 66 (12): 2069–2110. arXiv:cond-mat/0309604. Bibcode:2003RPPh...66.2069V. CiteSeerX 10.1.1.305.3880. doi:10.1088/0034-4885/66/12/R01. ^ a b c d Condensed-Matter Physics, Physics Through the 1990s. National Research Council. 1986. ISBN 978-0-309-03577-4. ^ Malcolm F. Collins Professor of Physics McMaster University (1989-03-02). Magnetic Critical Scattering. Oxford University Press, USA. ISBN 978-0-19-536440-8. ^ a b Chaikin, P. M.; Lubensky, T. C. (1995). Principles of condensed matter physics. Cambridge University Press. ISBN 978-0-521-43224-5. ^ Wentao Zhang (22 August 2012). Photoemission Spectroscopy on High Temperature Superconductor: A Study of Bi2Sr2CaCu2O8 by Laser-Based Angle-Resolved Photoemission. Springer Science & Business Media. ISBN 978-3-642-32472-7. ^ Siegel, R. W. (1980). "Positron Annihilation Spectroscopy". Annual Review of Materials Science. 10: 393–425. Bibcode:1980AnRMS..10..393S. doi:10.1146/annurev.ms.10.080180.002141. ^ Committee on Facilities for Condensed Matter Physics (2004). "Report of the IUPAP working group on Facilities for Condensed Matter Physics : High Magnetic Fields" (PDF). International Union of Pure and Applied Physics. The magnetic field is not simply a spectroscopic tool but is a thermodynamic variable which, along with temperature and pressure, controls the state, the phase transitions and the properties of materials. ^ Moulton, W. G.; Reyes, A. P. (2006). "Nuclear Magnetic Resonance in Solids at very high magnetic fields". In Herlach, Fritz (ed.). High Magnetic Fields. Science and Technology. World Scientific. ISBN 978-981-277-488-0. ^ Doiron-Leyraud, Nicolas; et al. (2007). "Quantum oscillations and the Fermi surface in an underdoped high-Tc superconductor". Nature. 447 (7144): 565–568. arXiv:0801.1281. Bibcode:2007Natur.447..565D. doi:10.1038/nature05872. PMID 17538614. ^ Buluta, Iulia; Nori, Franco (2009). "Quantum Simulators". Science. 326 (5949): 108–11. Bibcode:2009Sci...326..108B. doi:10.1126/science.1177838. PMID 19797653. ^ Greiner, Markus; Fölling, Simon (2008). "Condensed-matter physics: Optical lattices". Nature. 453 (7196): 736–738. Bibcode:2008Natur.453..736G. doi:10.1038/453736a. PMID 18528388. ^ Jaksch, D.; Zoller, P. (2005). "The cold atom Hubbard toolbox". Annals of Physics. 315 (1): 52–79. arXiv:cond-mat/0410614. Bibcode:2005AnPhy.315...52J. CiteSeerX 10.1.1.305.9031. doi:10.1016/j.aop.2004.09.010. ^ Glanz, James (October 10, 2001). "3 Researchers Based in U.S. Win Nobel Prize in Physics". The New York Times. Retrieved 23 May 2012. ^ a b c Yeh, Nai-Chang (2008). "A Perspective of Frontiers in Modern Condensed Matter Physics" (PDF). AAPPS Bulletin. 18 (2). Retrieved 19 June 2018. Mudry, Christopher (2014). Lecture Notes on Field Theory in Condensed Matter Physics. World Scientific. doi:10.1142/8697. ISBN 978-981-4449-10-6. Khan, Abdul Qadeer (21 November 1998). "Dimensional Anistrophy in Condensed Matter Physics" (PDF). Seven National Symposium on Frontiers in Physics. 7. 7 (7). Retrieved 21 October 2012.